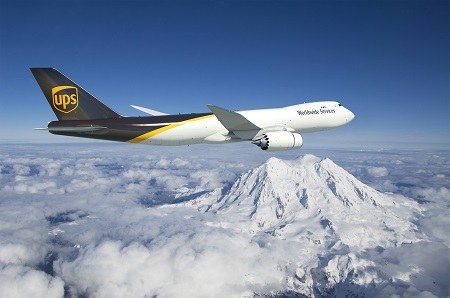 EVERETT, Wash., Oct. 27, 2016 – Boeing and UPS today announced an order for 14 747-8 Freighters. The agreement also includes an option to purchase an additional 14 of the cargo airplanes. EVERETT, Wash., Oct. 27, 2016 – Boeing [NYSE: BA] and UPS [NYSE: UPS] today announced an order for 14 747-8 Freighters. The agreement also includes an option to purchase an additional 14 of the cargo airplanes. The 747-8 Freighter is the world’s most efficient freighter, providing cargo operators the lowest operating costs and best economics of any large freighter on the market. With its iconic nose door, the airplane has 16 percent more revenue cargo volume than the 747-400F. The airplane also reduces the noise footprint around an airport by 30 percent compared to its predecessor. "UPS could not have selected a better aircraft to meet its growing business needs," said Brad McMullen, vice president, Sales, North America and Leasing, Boeing Commercial Airplanes. "We’ve continued to make the 747-8 Freighter even better, and we look forward to seeing UPS introduce it to its fleet." With 109 747-8 passenger and freighter airplanes delivered to customers around the globe, the fleet is performing with the highest dispatch reliability and utilization of any four-engine airplane in service.